Vice Consul Ralf Roldan and Consul Mary Luck Hicarte, Cultural Section Head, present the award to Mr. Virgilio A. Castillo, Jr of De La Salle – College of Saint Benilde. 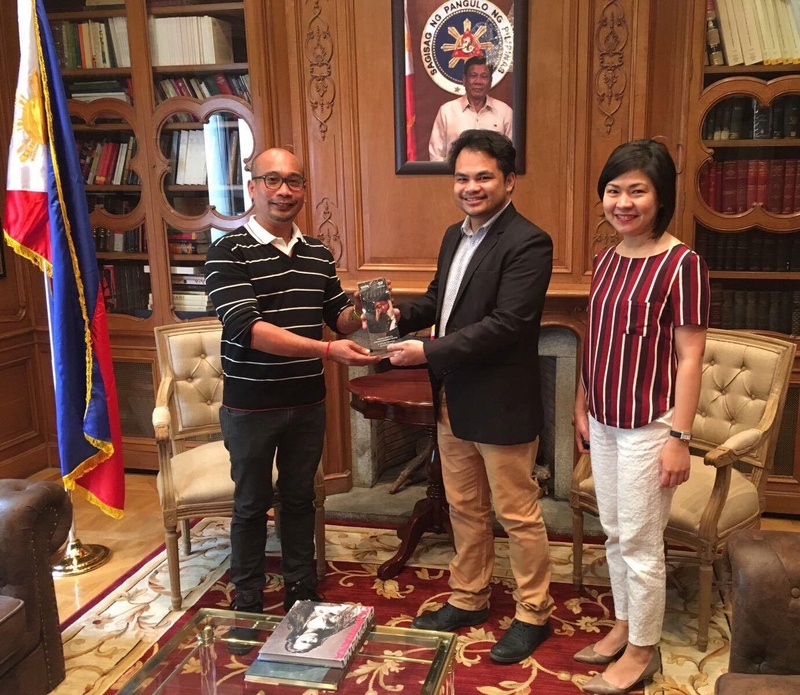 Dulaang Filipino of De La Salle – College of Saint Benilde, represented by Mr. Virgilio A. Castillo, Jr., Head, Office of Culture and Arts, officially received the award for best international performance from Escenamateur on 02 June 2017 in a simple ceremony at the Philippine Embassy in Madrid, Spain. Dulaang Filipino was proclaimed winner on 01 April 2017 at Sala Berlanga, Madrid where Vice Consul Ralf Roldan received the award on behalf of the Saint Benilde theater group and thanked the organizers for the award. Dulaang Filipino´s production of “Oedipus” was recognized by the International University of La Rioja during the award gala of the Premios Escenamateur, besting other international entries. ESCENAMATEUR is the confederation of amateur theater associations throughout Spain, working since 2009 for the recognition of the work performed by amateur theater groups.